AVO attributes have been used for the purpose; first it used to be the intercept and gradient stacks, and later other attributes began to be derived. Especially after the Fatti’s approximation (Fatti et al., 1994) was introduced, the P- and S- reflectivity extracted from seismic data could be inverted into the P- and S- impedance attributes, and used for deriving the rock physics parameters as well as make the lithology and fluid predictions. Goodway et al. (1997) and Goodway (2001) took advantage of the fact that although traditional AVO and petrophysical analysis both exploit seismic compressional and shear velocities to indicate changes in pore fluid and lithology, the subsequent inversion of AVO results could be used to derive elastic rock properties for improved petrophysical discrimination. Their method entailed the derivation of P and S AVO stacks from the prestack gathers and then inverting them to get Lame’s moduli parameters, (λ and μ and the density ρ). Isolation of λρ and μρ gives greater physical insight into the pore fluid and lithology changes. This technique referred to as AVO-LMR analysis is now regarded by some as an indispensable method. Rock physics analysis, along with the available petrophysical information, helps in creating a subsurface model that honors all data and in understanding the elastic properties of the lithounits of interest. Crossplots of different pairs of attributes derived from well data are first generated and examined, in search for at least one of the attributes crossplotted that could be derivable from seismic data. Rock physics templates are an effective tool for delineation of litho and fluid trends, a visual integration of well-log and seismic data and their calibration are used as an aid or guide while analyzing the elastic inversion derived attributes, leading to quantitative interpretation. 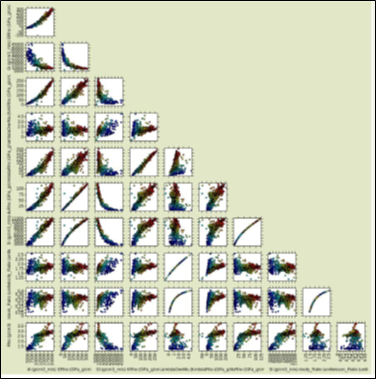 Crossplots between pairs of variables derived from well log data. The generation of such a crossplot template is useful in that it shows at a glance the variation of different attributes and helps decide on what pairs of variables would help in the shale characterization workflow. Crossplot of Lambda-rho versus Mu-rho computed for well data from the Montney shale in British Columbia, Canada. 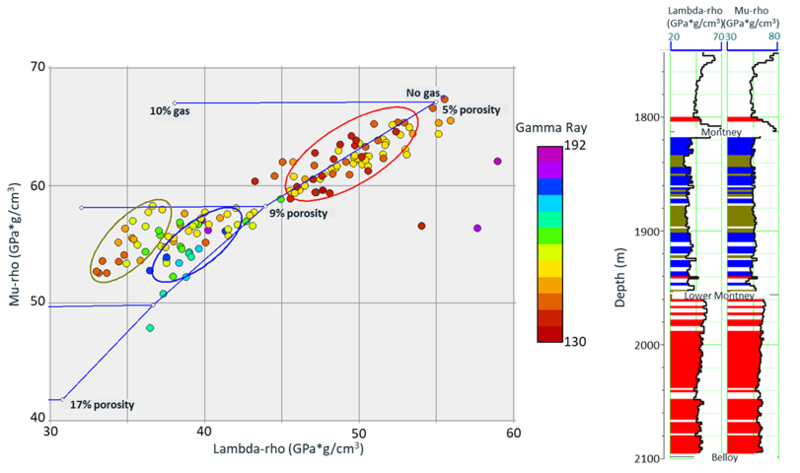 Rock physics templates for porosity and gas saturation are overlaid in blue and show the variation trends for the two properties.